Israeli forces entered a village in the southeast corner of Lebanon Saturday, but Israeli and Lebanese accounts differed over whether the Israeli military had taken control over the area. Israel's incursion into Maroun al-Ras came after it pounded the area with bombs and artillery throughout the night. The village is believed to be a launching point for rocket attacks on northern Israel. Several Israeli soldiers, backed by artillery and tank fire, moved into the large village of Maroun al-Ras on the Lebanese side of the border, military officials said on condition of anonymity citing the sensitivity of the information. Afterward, as some of them returned, officials said the village was under Israeli control. But Lebanese security sources, who also spoke on condition of anonymity because of the sensitivity of the information, said that the Israeli military had made incursions of only a few hundred yards into Maroun al-Ras and Yaroun villages. The raid was part of Israel's wider strategy of running a "limited" ground operation aimed at destroying Hezbollah's tunnels, hideouts and weapons stashes in south Lebanon. U.N. peace keepers and witnesses said the Israeli incursion also briefly held the border village of Marwaheen before pulling back. Early Saturday Israeli aircraft and artillery pounded Lebanese roads and villages in the path of its troops. Witnesses said the attacks appeared focused on areas across the border from where the Israeli military presence was heaviest. With Hezbollah's rocket attacks and Israeli bombings undiminished, Secretary of State Condoleezza Rice said she would visit the Middle East beginning Sunday - her first trip to the region since the crisis erupted 10 days ago. But she ruled out a quick cease-fire between Israel and the Shiite guerrillas as a "false promise." Israel, which pulled its troops out of Lebanon just six years ago after a lengthy and costly occupation that caused painful divisions within the Jewish state, was poised to carry out its third large-scale ground operation in Lebanon since 1978. This time, however, the Israelis signaled they did not want to stay long. Israel hopes the operation will end in the neutralization of Hezbollah. But the operation carries great risks for the country and the region. If Lebanon's weak central government is undermined, it could immerse the country again into disorder and ignite fresh passions in many Arab countries against Israel and the United States. 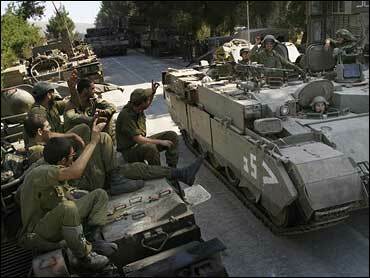 On Friday, the Israeli army confirmed that small units have been operating in Lebanon for days. An official from the U.N. monitoring force in south Lebanon said 300 to 500 Israeli troops were believed to be in the western sector of the border, backed by as many as 30 tanks -a likely precursor to a larger ground force that Israel could use to sweep Hezbollah out of the area. Israel's goal is not to create a buffer zone as it did during its occupation of southern Lebanon from 1982 to 2000, said a senior military official, speaking on condition of anonymity because of the topic's military sensitivity. Rather, Israel wants to weaken Hezbollah with a limited ground operation to make it easier for the Lebanese army to move into areas previously controlled by the guerrillas, possibly with the aid of a beefed-up international peacekeeping force, the official said. Israeli warplanes and artillery repeatedly targeted the large Lebanese border village of Maroun al-Ras, the southern town of Nabatiyeh and the disputed Chebaa Farms area early Saturday, witnesses and Lebanese media reported. Nabatiyeh, located about 10 miles north of the border, was heavily bombed a day earlier. The strikes came just hours after Israeli tanks and armored personnel carriers lined up on the other side of the frontier - in some places within sight of Lebanese homes. A barrage of 11 Hezbollah rockets, meanwhile, rained down on Israel's third-largest city, the northern port of Haifa, wounding at least five people. The army said rockets also hit Rosh Pina, Safed and communities near the Sea of Galilee. Hezbollah has fired hundreds of rockets at northern Israeli towns from north of the Lebanese border, killing 16 civilians and forcing hundreds of thousands of Israelis to flee repeatedly into bunkers. Meanwhile, saying it's time to work urgently to bring stability to the region, Secretary of State Condoleezza Rice will travel there (video) Sunday in hopes of reaching a Mideast peace deal. The army's chief of staff said forces would conduct ground operations as needed in Lebanon, but they would be "limited." Lt. Gen. Dan Halutz also said nearly 100 Hezbollah guerrillas have been killed in the offensive in Lebanon. "We will fight terror wherever it is because if we do not fight it, it will fight us. If we don't reach it, it will reach us," Halutz said in a nationally televised news conference. "We will also conduct limited ground operations as much as needed in order to harm the terror that harms us." After 10 days of the heaviest bombardment of Lebanon in 24 years, Israel appears to have decided that a large-scale incursion is the only way to push Hezbollah back. But Israeli leaders are quick offer assurances that this invasion will be different from two decades ago, reports CBS News chief foreign correspondent Lara Logan. Many in Israel still remember the long ordeal their troops faced the last time they invaded Lebanon in 1982, and the costly 18-year occupation that became Israel's Vietnam. "If we carry out an operation to uproot, let's say, full fortresses — by the way, (there are) incredible fortresses on the border — by Hezbollah with tons and tons of ammunition and explosives in the ground, that doesn't mean we conquer Lebanon," Yitzhak Herzog, an Israeli Security Cabinet member, told Logan. As sunset approached, long lines of tanks, troops, armored personnel carriers and bulldozers lined up on a two-lane highway in northern Israel. In one area, the soldiers were close enough to see Lebanese villages and homes. An Israeli military radio station warned residents of 12 border villages in southern Lebanon to leave before 2 p.m. Friday. Indonesia offered to send hundreds of peacekeepers to Lebanon to help bolster security in the Middle Eastern nation following Israeli incursions and airstrikes, the foreign minister said Saturday. Hassan Wirajuda urged the U.N. Security Council to take immediate steps to halt the violence. He said his country, which has more Muslims than any other in the world, was prepared to send one battalion, approximately 750 troops, to the region if the United Nations decided it was necessary. "We see exaggerated and disproportionate violence taking place in Lebanon," Wirajuda was quoted as saying by the state news agency Antara. "Indonesia is prepared to send one battalion of peacekeepers." Wirajuda also told reporters that Indonesia - which does not have diplomatic ties with Israel - will provide $1 million in humanitarian assistance for the Palestinian territories and Lebanon. Indonesia has previously condemned the Israeli strikes against targets in Lebanon and Gaza, and President Susilo Bambang Yudhoyono made a similar pledge earlier in the week. His country last contributed to an international peacekeeping force in Kosovo in the 1990s. Israel announced it will open a humanitarian corridor to allow food, medicine and other aid into Lebanon a day after the United Nations warned of a growing humanitarian crisis from more than a week of intense fighting. Israel's U.N. Ambassador Dan Gillerman said Friday he expected the humanitarian corridor to be opened later Friday or Saturday. He said later there would be a land corridor to Sidon and a sea corridor to Cyprus. The Israeli announcement followed appeals from Secretary-General Kofi Annan and many Arab and Western leaders including French President Jacques Chirac who called for "a humanitarian truce." The Israeli military said Saturday it was holding the bodies of at least 13 Hezbollah militiamen killed in fighting near southern Lebanon's border with Israel on Thursday, but said Israel had no plans to bargain with the remains over two abducted Israeli soldiers. "We are in the process of deciding what to do with the Hezbollah bodies," a spokeswoman quoted army's chief of staff, Lt. Gen. Dan Halutz as telling a Friday night media briefing. "We do not trade in bodies." Halutz said the 13 bodies were removed from the battlefield out of respect for the dead. Ships lined up at Beirut's port as a massive evacuation effort to pull out Americans and other foreigners desperate to flee. U.S. officials said more than 8,000 of the roughly 25,000 Americans who live or work in Lebanon will be evacuated by the weekend. Hezbollah militants fired at least 11 rockets at Israel's port city of Haifa, wounding five people, CBS News correspondent Lee Cowan reports. Israeli warplanes pounded Lebanon's main road link to Syria, collapsing part of Lebanon's longest bridge. A U.N.-run observation post near the border was hit, but no one was hurt. Lebanese soldiers buried 72 people killed in recent bombings in a mass grave just outside a barracks in the southern city of Tyre. Volunteers put the bodies, many of them children, in wooden coffins and spray-painted the names of the dead on the lids. Two Apache attack helicopters collided in northern Israel near the Lebanon border, killing one air force officer and injuring three others, Israeli officials said. Israel's air force began an investigation. International efforts to get humanitarian aid to Lebanon appeared to be getting off the ground Friday. Israel agreed to allow a safe corridor for international aid. Greece delivered 22 tons of supplies to Beirut on a ship sent to pick up Greek evacuees. The Red Cross, coordinating with Israeli authorities, brought 24 tons supplies to the Lebanese coastal city of Tyre. UNICEF will be delivering water kits, purification tablets, water containers, essential drugs and toys over the weekend to Damascus for road shipment to Lebanon. Australia, France, Great Britain, Turkey, Iran, and Norway have also pledged aid. The Lebanese health ministry reported 361 deaths in Lebanon so far in the onslaught, an increase of 55 since it release figures on Thursday. Thirty-four Israelis also have been killed, including 18 soldiers and an air force officer killed Friday in the collision of two helicopters. The count of 361 includes six Hezbollah fighters that the group has confirmed were killed, including three who died Friday. Israel's army chief of staff said Friday that nearly 100 Hezbollah guerrillas have been killed in the offensive in Lebanon, launched after the militant Shiite Muslim group captured two Israeli soldiers on July 12. The United States, which has resisted calls to press its ally to halt the fighting, was sending Secretary of State Condoleezza Rice to the Mideast on Sunday. She ruled out a quick cease-fire as a "false promise" and said "Hezbollah is the source of the problem." CBS News chief White House correspondent Jim Axelrod reports that the fact that Rice is not coming to Israel until Sunday is an implied green light to Israel to keep hammering at Hezbollah for at least two more days. "Syria knows what it needs to do and Hezbollah is the source of the problem," Rice said Friday at the State Department as she outlined U.S. hopes for a diplomatic solution to the current crisis. She said she was meeting not only with Israeli Prime Minister Ehud Olmert but also with Palestinian President Mahmoud Abbas as well as with allies at a gathering in Rome. "The main problem with a cessation of the violence is that the crisis began with a terrorist group, not a nation," said CBS News foreign affairs analyst Pamela Falk, "and now, the Secretary of State, in her trip to the region, needs to hear from Israel and Lebanon as well as address the role that Syria and Iran play in supporting Hezbollah." The U.N. estimated that a half-million people have been displaced, with 130,000 fleeing to Syria and 45,000 believed to be in need of assistance. Top Israeli officials said Israel won't stop its offensive until Hezbollah is forced behind the Litani River, 20 miles north of the border, creating a new buffer zone in a region that has already seen 18 years of Israeli presence. Israel has stepped up its small forays over the border recently, seeking Hezbollah positions, rocket stores and bunkers. Each time it has faced tough resistance. While the Hezbollah stronghold on Beirut's southern edge is being systematically reduced to rubble, most of the city remains virtually untouched, reports CBS News correspondent Elizabeth Palmer. Shops are open, traffic is heavy, and, because frequent power cuts interrupt air conditioning inside, many in Beirut are outside, by the waterfront, taking in the air. But despite the lack of attacks and rubble, Palmer reports, the residents are aware that their country and its economy have been badly battered and will take years to recover. Hezbollah-controlled areas are not as lucky. Israeli warplanes fired missiles that partially collapsed a 1.6-mile suspension bridge linking two steep mountain peaks, part of the Beirut-Damascus highway in central Lebanon. The bridge has been hit several times since the fighting began. The bombing also set ablaze three buses that had just dropped off passengers in Syria, but the drivers escaped, police said. Renewed attacks struck the ancient city of Baalbek, a major Hezbollah stronghold, and security officials said two people were killed and 19 wounded. Hezbollah strongholds in south Beirut and elsewhere also were struck overnight, killing one person. Missiles hit a village near the Israeli border, Aita al-Shaab, killing three, officials said. A house in the border village of Aitaroun was flattened, with 10 people believed inside, but rescuers could not reach it because of shelling, security officials said. Meanwhile in Northern Israel, at least 11 rockets hit Haifa, Israel's third-largest city, and five people were wounded, with 23 treated for shock. More rockets fell elsewhere in northern Israel, the army said, with strikes reported in Rosh Pina, Safed and in several communities near the Sea of Galilee. Hezbollah has fired hundreds of rockets from the Lebanese border since fighting began, forcing Israelis into underground shelters. Eight people in Haifa were killed July 16. Hezbollah said three of its fighters had been killed in the latest fighting, bringing to six the number killed since Israel launched the military campaign against Lebanon after the militant Shiite Muslim group captured two of its soldiers July 12. Hezbollah leader Sheik Hassan Nasrallah shrugged off concerns of a stepped-up Israeli onslaught, saying the captive soldiers held by his guerrillas would be freed only as part of a prisoner exchange brokered through indirect negotiations. Israel invaded Lebanon in 1982 when its forces seized parts of Beirut. It eventually carved out a buffer zone that stopped at the Litani. That zone was reduced gradually but the Israeli presence lasted until 2000, when it withdrew completely.